Adobe Arabella is an idyllic organic retreat, located in Santa Fe’s Historic Eastside on a serene residential lane within easy walking distance of Canyon Road, the Historic Santa Fe Plaza, and the foothills of the Sangre de Cristo Mountains. This tranquil sanctuary—concealed behind ivy covered adobe walls —offers convenient access to world class galleries, museums, restaurants, spas, the farmers’ market, skiing, mountain biking and much more without the touristy downtown bustle. Simply put, Adobe Arabella is paradise found! Historic & Modern: Adobe Arabella offers authentic Santa Fe charm with century old Pueblo Revival architecture and quintessential New Mexican design elements such as wood burning kiva fireplaces, viga ceilings, private courtyards with soothing fountains, and a traditional portal-covered patio. Totally renovated three times since 2008, this modern vacation rental features lofty, natural light-filled rooms and an open floor plan with plenty of space for cooking, dining and entertaining. Luxurious green design (eco-friendly, nontoxic materials and furnishings) and user- friendly amenities throughout the home pamper the most discriminating travelers. Antiques and contemporary décor mingle in a whimsical marriage of design and adventure. Original design+built furnishings (many commissioned with local Santa Fe artists and designers) and tastefully restored mid-century modern furniture with collection of art. Unwind in two enclosed, private outdoor areas with gardens, fountains, dining, lounging and grilling. The portals, patio, seamless inside/outside flow and lofty ceiling heights create an open, expansive feeling yet ensure your total privacy. Green Design: Adobe Arabella balances Santa Fe allure with healthy, eco-friendly design to ensure a soothing, healing sanctuary for your mind and body while reducing impact to the earth. Full house HEPA air filtration system and HEPA filtered vacuum cleaner eliminate dust and airborne particulates. Energy efficient appliances and other systems minimize energy consumption while maintaining a comfortable, modern home. LED energy saving lighting used throughout the home. Natural, nontoxic cleaning products, fertilizers and pest maintenance solutions ensure a sanitary, pollution-free residential environment. Synthetic chemicals and heavily scented products are strictly avoided to accommodate guests with chemical sensitivities. Chemical-free, 100% organic mattresses composed of natural Dunlap and Talalay rubber, organic cotton, and untreated wool (naturally fire-resistant) guarantee rejuvenating, restful sleep. 100% organic cotton bath towels and robes are available. Upholstered furniture is comprised of natural materials inside and out. Most of the furniture has been re-upholstered with organic coverings and natural rubber/organic cotton interiors. Upholstered headboards are custom-made and fully organic inside and out. All curtains, throw blankets, rugs and other fabrics in the home are also all comprised of natural materials ranging from organic cotton to untreated cashmere, wool, linen, bamboo, silk, animal hides and hemp. Wood furniture and decor are hand-made (many by local artisans) with natural materials and non-toxic finishes. All natural stains and sealers were used on floors, furniture and other surfaces. Adobe Arabella is equipped with efficient heating and air conditioning, but many guests may find that they are unnecessary. Thick adobe walls regulate internal temperatures on the warmest and coolest days as they have for centuries. Large windows, skylights and multiple exterior doors permit generous air circulation and ample sunlight. This reduces dependence on artificial air and lighting systems while favoring natural comfort over energy consumption. During crisp winter days passive solar warms Adobe Arabella. Heavily interlined natural draperies and energy efficient windows and doors insulate against drafts at night. Approximately 1,400 net square feet. Adobe Arabella is an ideal retreat for guests with chemical sensitivities, allergies or for those who just prefer a natural, healthy indoor space without sacrificing the luxuries, comforts and conveniences of modern living. 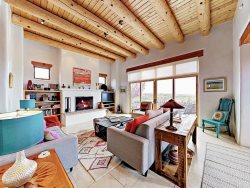 This fully renovated adobe home built in the 1920s offers traditional Santa Fe charm coupled with modern attention to detail. • Approx. 1400 Square Feet with open floor plan and high ceilings. • 2 Bedrooms—each with King Bed (each opens to a separate private courtyard). Bedrooms are well separated with living and dining spaces between. • 2 en-suite bathrooms with generous storage and light-offering windows. • Master bathroom offers double vanity, deep soaking tub and glass shower. • Guest bath has elegantly tiled glass shower, great storage, and single vanity. • Simultaneously spacious, cozy, and comfortable. • Light-filled space with large windows, multiple French doors and skylights. • Plush, custom organic mattresses. • Luxurious top–of–the–line cozy, organic bedding, bath towels, robes and custom organic furniture and draperies. • Located in Historic Eastside. • Unwind and relax in this romantic hideaway on a charming and intimate lane yet still be close to everything in town. • Three blocks to Canyon Road and six blocks to downtown. Downtown Subscription coffee shop, Garcia Street Books and Kaune’s gourmet market. • Several minute drive to Whole Foods. • Fifteen minute drive to Santa Fe Ski Basin. • Short walk to abundant hiking and biking trails. • Kiva fireplaces in living room and master bedroom. Exposed Viga beams throughout. • 42” HDTV flat-screen televisions in each bedroom and built-in television in living room all with Direct TV offering hundreds of channels and endless recording and Netflix viewing opportunities. • State of the art Sonos stereo system. • Bedside clock radios with sound-soothers, and mini-jack plug-in’s to play portable devices. • Spacious gourmet kitchen open to living and dining areas with Chef’s stainless steel appliances and granite countertops. • Two private courtyards in front and back—each with gardens, a soothing fountains, landscape lighting, and high adobe walls for maximum privacy. • Intimate garden sanctuaries offer extended indoor/outdoor living. • Inviting outdoor cushioned patio loungers with shading umbrella and exterior dining for six. The staff was extremely friendly, accessible and helpful. They made our experience easy, both before and after our arrival. The property was just as advertised, as well as, being perfectly stocked and comfortable. Also, the property was very well located for access to all Santa Fe areas. A beautiful restful and thoroughly happy place to spend time! We love Adobe Arabella so much we rented again next year for almost 4 months. Having owned and rented vacation properties in several states, and having been a real estate broker - Casas has perfected the industry. Conrad was great. When we called for additional recs, everyone was helpful. I am writing a blog post about our experience. 10 am checkout was too early. Otherwise, we loved it. It was a magical experience! This was a most happy experience for me and for each one of my guests. We all agreed that the house was exceptional and the City fantastic! Will be back next September for 5 weeks-same house! Every house we've rented has been perfect in every way. We had a fabulous time and loved our place. Your company helped us find the perfect place. Thank you!! Have always had great experience using Casas De Santa Fe. Todd and Lynn are the best. Supporting staff always friendly and helpful. I know when I refer Casas de Santa Fe to friends that great service will be delivered and that all your properties will never disappoint. We had a great visit. The feeling was like we lived in Santa Fe and got to enjoy the city in that way. We will definitely stay with you again the next time we are in town. A very good experience. We have reserved another rental for October/November through Casas.